At a time when America’s big digital media platforms are bracing for fines related to Europe’s new consumer data privacy regulations, the European Commission has fined Google the old fashioned way -- for antitrust. 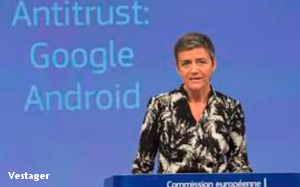 The commission this morning announced a record $5 billion fineagainst Google as part of an eight-year antitrust probe into the business practices it has used to give its Android operating system a dominant market position. The commission charged that Google’s restrictive licensing practices benefit its own service on Android devices, precluding competitors from gaining access. The decision brings to $7.8 billion the total fines levied by Europe against Google, including the $2.8 billion fine it issued last year related to Google’s “Google Shopping” search services. Observers expect more European fines to be issued soon, related to Google’s online display advertising contracts. 2 comments about "Europe Hits Google With $5 Billion Android Antitrust Fine". John Donohue` from White Tree Software, July 18, 2018 at 11:51 a.m. I think Apple should be sued for anti-trust because it leveraged its hipster ethos to entrap the world's narcisists into lusting for its products to fuel their emptyness.